When you teach in a Chinese English Language training school as a foreign teacher, you will very often find that parents of your students will come and find you because they have some feedback or some request regarding their children whom you are teaching. This is usually not something to be afraid of, and in most cases it just shows that the parents are actually interested in their kids learning in your class and they can also sometimes prove to be a helpful resource when students are acting up or do not review the content at home. One request that you are going to hear a lot, is something along the lines of “I would like you to pay more attention to my son/daughter in your class”. Now, this is a legitimate request, however, in a class of 6 or 12 students, I get the same request from every other parent, so how do you pay special attention to all the students in your class? Let’s be realistic. 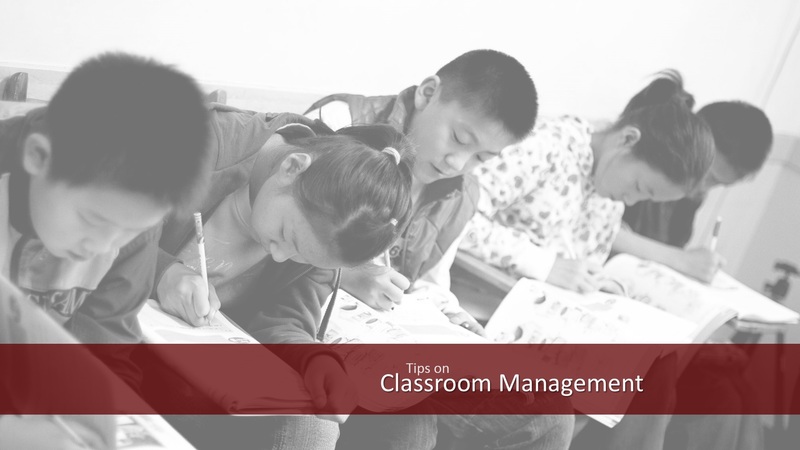 A typical class is anywhere from 60-120 minutes long. More often than not, it is either 60 or 90 minutes. If you have 6 students in a class, you could spend 10 minutes talking to each of them, however, instruction, presentation, practice and activities do take up the bulk of your time, leaving you maybe 15 minutes. And there is no meaningful way that you can spend 15 minutes divided by 6 students, or even 12. Giving special attention to one student, is not something that happens in a single class, but you have to think of it over time, over the course of the classes you are giving, how much time are you (roughly) spending on each student. This can be hard to track, some students are simply more active and attract your attention, some need more help and some students are perfectly happy, being in the middle, without too much of your attention. But over the course of maybe a month, try and make sure that you have spent a certain number of minutes, talking to each student. Not in a single class, but over the course of a period of time. Paying the needed attention to students, also doesn’t HAVE to be by directly talking to or with them. There are naturally some students who talk more and are more engaged in classes than others, and as a teacher, you should also try to engage the students who speak a little less. Call on the students who do not always raise their hands, ask them questions during class or use them to demonstrate activities that you are doing. If you have the time and energy, try and talk to the students before and after class to make them more comfortable around you, and this, in turn, will help them feel more confident during class and they will talk more, learn more and therefore also perform better. Use a variety of different ways to choose students to answer questions. Instead of simply gesturing or calling their name, spin a wheel of fortune with the students names on it, spin a bottle on the floor or throw a dice, anything that is a little more random. For one, the students will know that there is an equal chance of being selected, which means they all have to prepare an answer, and two, you won’t be accused of having a favorite student. Getting three sixes in a row on the die is pure chance, right? RIGHT? Finally, keep your eyes peeled. You’d be amazed at how much your students are communicating with you, without saying a word. Look at their faces, look at their eyes. With some practice, you’ll learn what each student looks like when they are concentrating, when they are tired, or more importantly, when they do not understand what you want them to do, but are too afraid to ask. Pay close attention, because as much as you should be watching them, believe me when I say, the students are watching you very closely. One of my favorite compliments I ever got from one of my supervisors, was how she felt like I understood my students and knew what they wanted before they even raised their hands. I could tell when my students didn’t understand, and I knew when they were just pretending and playing silly. Also, she told me that my students must be very confident with me, as they always asked when they didn’t understand something, and they were never afraid to give a wrong answer which is rare as Chinese people are generally afraid of losing face. But this also took a lot of work and a lot of practice. It takes time to get to know your students, and it takes time for them to get to know you and feel comfortable around you. But it will be well worth it in the end.